The Clown House is a loose collection of clowns and counter-culture bike enthusiasts who have put together a clown collective/performance group. They all live together in a large house in a rapidly gentrifying section of Portland, Oregon, providing a free space to sleep for itinerant travelling circus performers and other like-minded folk who blow through town. 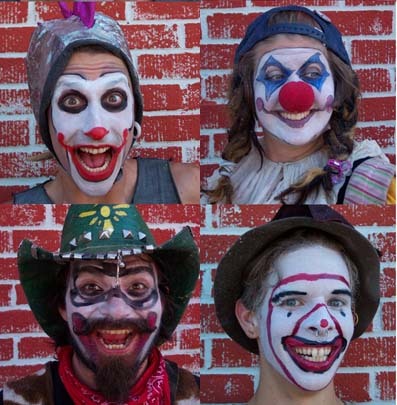 Portland has a motto, “Keepin’ It Weird” and the clownhouse guys do their part. The show is a bike rodeo, featuring fantastically large bicycles, juggling and circus skills, wacky stunts, and other delights. They often perform on the street, as part of a roving crazy parade. They do all ages shows and burlesque shows for the over-21 crowd. 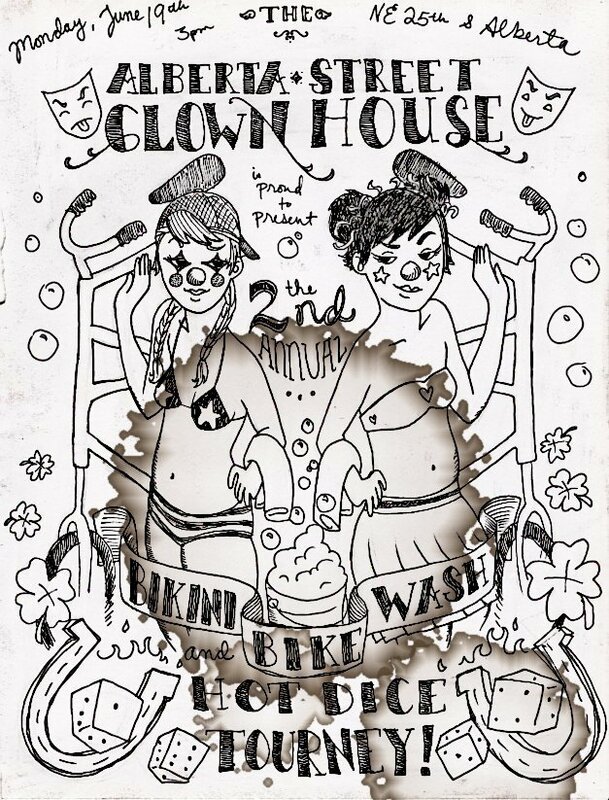 They do events at the house, including a Bike Bikini Wash in which the clowns wash bikes while wearing bikinis. Oh yes, and for $15, they will pie just about anyone. Performers and denizens of the house currently include: Pinga de Clown, Dingo Dismal (who is the chief of the house, and runs a blog about what’s going on), Chlorine Enema Jones, and Will Workforf Ood. Not to mention children, dogs, cats, and any other people that want to hang. The neighborhood of the clown house is getting pricey, and soon they may have to move from their digs to find a cheaper place to hang their hats and trampolines.